The Cheeky Panda Bamboo Toilet Roll is 3 ply, super absorbent, soft, and strong. FSC Certified, and made from 100% Bamboo which can grow up to 20/30 times faster than trees. 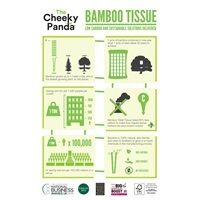 The Cheeky Panda Toilet Roll is skin friendly and an excellent alternative to traditional tissue products. 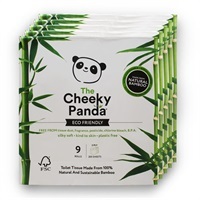 Organic, hypo allergenic, FSC certified, and free from B.P.A, formaldehyde, chlorine, fragrance and de-inking agents, 'The Cheeky Panda Toilet Roll' is both sustainable and perfect for sensitive skin.